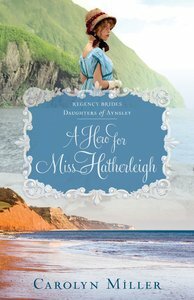 About "The Making of Mrs. Hale (Regency Brides: Daughters Of Aynsley Series)"
Carolyn Miller lives in New South Wales, Australia, with her husband and four children. A longtime lover of Regency romance, Carolyn has won a number of RWA and ACFW contests. She is a member of American Christian Fiction Writers and Australasian Christian Writers. Her previous best sellers include The ElusiveMiss Ellison and Miss Serena's Secret.